Most people are writing plain text files if they plan to publish it in the web today. WYSIWYG HTML editors supposed to make web publishing easier but everybody knows that such editors produce garbage nobody wants. You would think that there would be something learn when you find a failed product remotely similar to yours. My generic purpose structure editor could also do word processing. Unfortunately there's no lesson to learn. The authors of these editors simply didn't know their stuff! Whoever programmed WYSIWYG editors had never studied EMACS. Rather than having set of editing macros, each vendor preferred the monolithic kidney stone software. It was expected users would just obey sheepishly on what the software likes to do. Anyone can program an EMACS -editor while it is running. Makes it bit easier for an editor to match what the users need. HTML WYSIWYG authors worked on basis that websites would be yet an another sheet of paper filled with words. Many vendors sticked to the editing concepts in the Microsoft Word. You could change the font color, style, size to match your current mood and attitude. All the WYSIWYG editors insist that you must be able to change the font randomly in middle of a sentence. They insist everything is a big wall of text, partitioned into lines. It was really dumb, especially considering the pages were viewed in a browser and not inside the editor. The layout would immediately be wrong when you view it outside an editor. HTML has changed a lot over the time. But was never a good format for WYSIWYG editors. Although web browsers see HTML, very few are using it to produce websites as it is a too complex format for that. 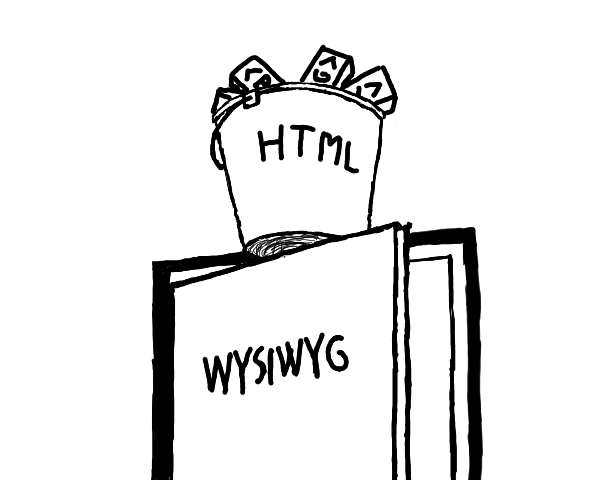 Aside outputting HTML, WYSIWYG editors generally disregarded the establishing standards, messed up with elements and overall did idiotic things such as using absolute pathnames as URLs or feeding the URL into the alt -tag in an image element.